When most people think of California beach vacations, they picture sunbathing, surfing, fishing, or taking a stroll along the boardwalk. With thousands of miles of coastline, finding the ideal California beach town for your vacation desires might seem overwhelming. Luckily, there are plenty of places to choose from to enjoy the perfect California beach vacation. Here are top options to consider, listed geographically from north to south. Irish Beach is a small vacation rental community south of the town of Mendocino. Situated near an area of undeveloped coastline, Irish Beach is the perfect refuge for anyone who wants to relax, away from crowds and tourists. In addition to the breathtaking scenery and a romantic lighthouse, wineries, golf courses, and numerous state parks are nearby for those seeking a little adventure. The best place to stay for laid-back ambiance at the ocean's edge in is a rental home from Irish Beach Rentals. Near the mouth of Tomales Bay, the little village of Dillon Beach sits on the hillside above the ocean. It's packed with rental houses and not far from the Tomales oyster farms and Point Reyes (also known as the windiest place on the Pacific Coast). The area is scenic and just isolated enough to have the makings of a truly memorable California beach vacation. Try Moore Vacation Rentals or Dillon Beach Property Management to find a place to stay at Dillon Beach. Famous for its classic oceanfront amusement park and "Surf City" reputation, Santa Cruz is as good as it gets for a classic California beach vacation. This location is ideal for a family beach vacation in California, thanks to its family-friendly atmosphere, free admission to the amusement park, and Monterey Bay National Marine Sanctuary located along the boardwalk. Find out how to plan a getaway to Santa Cruz. Travelers can experience a classic California beach vacation at Pismo Beach located halfway between Los Angeles and San Francisco. Activities range from golfing, surfing, horseback riding, shopping, exploring the sandy beach via ATV, or taking part in a clam chowder eating contest. Plan your ​Use this guide to plan your Pismo Beach vacation. Known for its miles of sandy beaches, Cayucos is the ideal location for a California beach vacation year round, thanks to its mild weather. Visitors can enjoy rock or surf fishing, sea kayaking, swimming, or sunbathing. With several hotels next to the area's beaches, plus a variety of restaurants, antique shops, and art galleries, Cayucos has all of the ingredients that make for a great California beach getaway. Discover more about spending a weekend in Cayucos. Malibu is the iconic California beach town, but it's more residential than touristy. Though homes are situated along 20 of the area's 27 miles of coastline, there are still plenty of ways to interact with the ocean and sand. Consider visiting the Malibu Pier, Surfrider Beach, or the Malibu Lagoon. Besides hotels in the area, you can find nice beach houses for rent through California Vacation Rentals. Get started right away. Use this complete guide to plan your getaway to Malibu with this. Redondo Beach is one of the South Bay beach towns in Los Angeles that​ line the shores of the Santa Monica Bay. It's an ideal choice for a California beach vacation, close to the ocean yet offering plenty of activities and attractions nearby. Stop by the sandy beach at Redondo where you can walk or play volleyball, rent a kayak or bicycle at the marina, board a deep sea fishing boat, or enjoy your favorite seafood at one of the many restaurants. Use this guide to plan a trip to Redondo Beach. One of Orange County's prettiest coastal towns, Laguna Beach has some great oceanside resorts and hotels, a breathtaking beach area, and a variety of shops, restaurants, and boutiques. Art-lovers tend to flock to Laguna Beach, thanks to the area's plethora of art galleries and summer art festivals. Learn more about Laguna Beach with this guide. Despite the hustle and bustle of San Diego, Mission Beach is still considered a hidden gem. Located on the ocean side of the peninsula that separates Mission Bay from the ocean, it is a great place to enjoy the California beach lifestyle like the locals. You'll find plenty of beach volleyball nets, a paved walking trail, the old-fashioned Belmont Park amusement park, and a peaceful atmosphere. Read here for more information about San Diego's Mission Beach. These selected resorts should also be considered for your California beach vacation. You'll find options that range from quiet and lowkey to action-packed and adventurous. Finding a place in California where you can actually camp on the beach isn't easy. Many places will present themselves as close to the coast when in actuality they are quite far away. 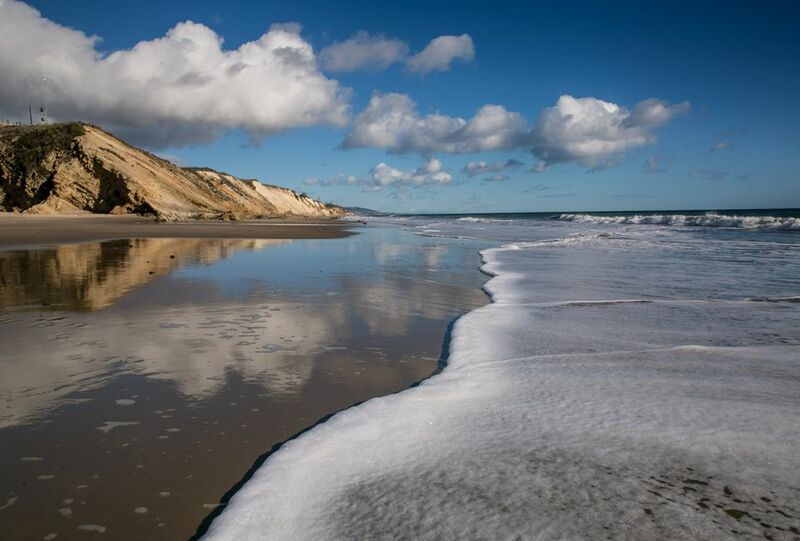 To help you find the places that are actually on the beach, visit Northern California Beach Campgrounds and Southern California Beach Campgrounds.